Hi everyone! I get a lot of questions on how we set up our school room desks. I thought I’d share it here for you all to check out! What does your school work area look like? 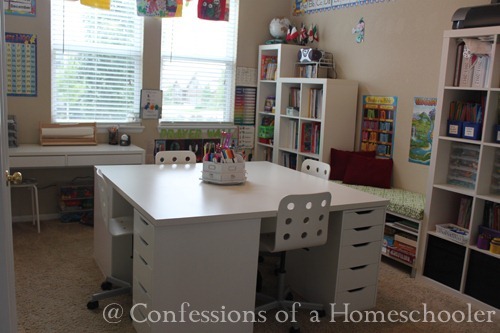 We have these exact desks after you posted a couple of years ago and I went out and purchased. Love them! I am going to seem like a creepy follower but I copy tons of things you do! I copied your Ikea desk set up and we LOVE it! I will post a pic as soon as we are able. I’ve wondered how the kiddos who sit with the “crack” handle it. Do they just work to the side or use a clipboard? Is it really not an issue. It seems like it would bother me but kids can be more flexible. @Bella they do fine, the crack doesn’t bother anyone except for my oldest. She doesn’t like to sit there. The desks have brackets below the crack, so they’re actually fairly smooth. I have the same desk set-up. I sit on the crack and I just put something under my paper when I need to…or I scoot a little to the side. But really, it is never a problem and I rarely remember it is there. I love the Ikea desks, we did not have it in the budget for new desks this year, but I had made the girls a desk a few years ago for Christmas and they like having them in the school instead of their bedrooms. They also each have a rolling cart to put all of the supplies on, since don’t have drawers, Something I really like about your Ikea desks. This is my oldest daughter’s desk, but all three have the same general set up. The crack doesn’t seem to bother my kiddos at all. We are hoping to get a piece of glass for the top. I think it will help with the shifting that happens and for clean up. But the quote we got was over $100, so it’s on hold for now. All in all, we love the set-up. Perfect for us with our 4 kiddos!!! Have you looked at Plexiglas for the table? I wonder if that might be cheaper and more forgiving. I unfortunately can not afford to buy desks, but my childrens dad is going to make them for me. I think that way I can make them more personal and then I can laquer (sp) them and they will be smooth and look nice. I may even personalize them for them. I think that my kids would really like that.